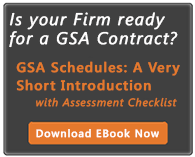 GSA Schedules have been a popular contract vehicle for large and small businesses alike, but in recent years, small business has grown its share of GSA schedule sales significantly since 2013. That year, the height of sequestration, cutbacks, and reduction of wartime spending, the small business share of GSA sales was 32%. For fiscal year 2016, that had grown to 43%; sales have grown from $11.4 billion in FY2013 to $13.5 billion in FY2016. Remarkable! Other than Small Business (i.e., mostly large and non-profit) and Women Owned Large Businesses have seen a marked decline as shown in the infographic below, averaging negative 9% and 6% respectively. But during this period, agencies have done well by the small business. HUBZone and 8A businesses led the way averaging year over year growth rates of 21% and 15%, but Economically Disadvantage Women Owned Small Businesses (EDWOSB) fared well (10% average annual growth) as did Service Disabled Veteran Owned Small Business (SDVOSB) (11% average). All other small business categories saw growth as well, although veteran owned small business hovered around just 1%-2% growth. Self-certified Small Disadvantaged Business (SDB) fluctuated quite a bit but averaged relatively flat growth over the three years. All in all, this is great news for small business as agencies seek to contract more with small businesses, and seem to use the GSA Schedule program to do this. However, just getting a GSA contract awarded is not the end game as it is no guarantee of success without effort. Firms must do their research and develop a go-to-market strategy. Companies must also train their team on how to comply with GSA contact terms and effectively sell using your GSA contract. You must know how agencies really buy and how to create your own deals with agencies using your contract.